At Stork Exchange parents often call us with an all too familiar phrase, “the airline broke my pram. What should I do?” It’s an unfortunate fact that your buggy can be easily damaged or lost while in transit. Due to their size and shape prams are inherently unsuitable for air travel. And while the world is not going to end without the buggy, it can be hugely inconvenient. We work with several airlines so we’re happy to share tips on how to avoid an airline breaking your pram, and if it happens, what you can do! Bulky prams that collapse into several parts are more prone to damage and to pieces going missing. So, before you set foot in an airport, consider buying something that will collapse in one piece. Umbrella style strollers are reasonably priced, very handy for travel but perhaps more suited to small children than babies. Travel buggies tend to be more expensive but are designed to make your life easier! Read our blog for a more detailed comparison between the two. Check your airline’s buggy policy prior to travel. Some airlines specify that you may only bring a fully collapsible stroller to the gate (Ryanair), i.e larger prams should be checked in. In addition, airlines such as Ryanair and SAS request that a buggy be packed in a protective bag, like the Pram Pack. Here’s a sneaky tip; a pram packed in a suitable bag is free luggage with many airlines. So if you have thick clothing items like jackets to bring on holiday, pack them around the buggy for more protection. It’ll save you some weight in your other bags! It depends on each airline, but most allow you to bring your pram all the way to the gate. In terms of damage limitation, this is a better option. Most damage occurs on baggage belts so it’s better to keep the pram in your care as long as possible. Bear in mind, sleeping or not, you will be asked to take the baby out when you go through security. You will also have to collapse and put the pram through the scanner. Worth remembering before over loading the buggy! Always fully collapse the buggy for ground handling agents. You don’t want them trying to figure out how to collapse it when they only have 25 minutes to turn an aircraft around. Have the buggy tagged, either at the gate or at check-in. If the airline mishandles it, it’s easier to track. It’s always better to have it recorded on the flight’s inventory too. Oh, and keep the tag number handy! Use a travel bag or some sort of protective cover. Aside from the weight tip mentioned above, the bags prevent damage such as scratches etc. More importantly though, a bag will prevent harness straps getting caught in the luggage belt, which leads to tears and breakage. It also prevents the equipment from getting wet, which is quite common in Ireland! 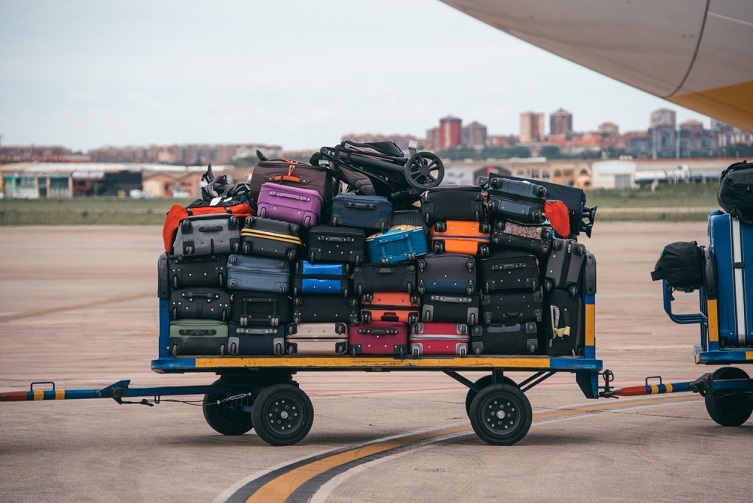 On arrival, once you reach the baggage hall, always check your bags and equipment for damage. When it comes to the airline definition of ‘damage’ be careful. An airline will not consider scratches on the chassis as ‘damage’ in most cases. The equipment has to be either soaking wet, torn, or visibly broken for the airline to process it as a claim. If your pram is damaged or doesn’t arrive, you must report it immediately to the airline. DON’T LEAVE THE BAGGAGE HALL WITHOUT REPORTING IT. Some airlines won’t accept a claim if you haven’t reported it while still at the airport. Keep all your ticket stubs, boarding cards, bag tags, everything! Again, it will make either tracking your equipment easier, or processing the claim faster. If you have to buy or hire a new buggy for the holiday, keep the receipts for that too, and include them in your claim. From what we’ve seen at Dublin Airport, provided you have a legitimate claim, the airline will reimburse you, either for repairs or for a replacement. It might take a couple of weeks and perseverance on your part, but you will be compensated.